i was reminded recently by Peter of another wonderful person in our lives. A man who led a remarkable life of thoughtfulness, mindfulness and bad-assed-ness. We didn’t know him personally but oh has he touched our lives deeply. I’m talking about none other than Mr. Bruce Lee. We know the legend. We have his books. We read and learn and sometimes forget he’s there in the bookshelf for us. 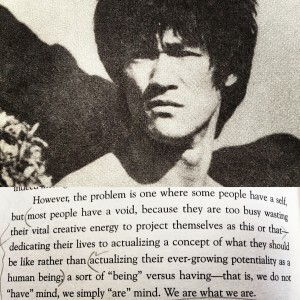 So it was Peter who brought out the old used bookstore copy of ‘Artist of Life’ and began chipping away at the wisdom of Bruce. Once again his writings have entered our lives. A few pages at a time while visiting the loo each am. Lightening the load shall we say. What better time to sit and think. Sometimes it’s the only time we have is when we sit in the can each morning.